So this is what I'm up to for Kenner (my nephew-to-be) The colors looks so much better in this pattern...which is odd...really since they are all mixed up as they were with the other pattern I was doing. This pic isn't that great, I hope to get another outside this weekend, natural light is so much better. But I wanted to post so you all know I'm getting on. Biggest problem with this? All the crappy ends to weave!!!!! The pattern is from Zoe Mellor's "Nursery Knits". 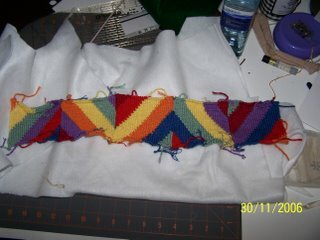 Since I'm using thinner thread it will have to be done with a few extra rows...but that will be ok. The colours do look really great in that pattern. Looks like you are knitting pretty quickly. It is looking lovely! You will fiqure out those ends, just keep going!! You are SO talented!! Looks lovely!!!!!!!!!!!!!! Wow, that looks amazing! You certainly are talented! Complicated looking! Good for you!! Oh, this is going to be amazing - I love how the colors go along together! It Looks lovely, I have that book and have also been tempted definately on the to do list. Any progress on the blanket? I think I am going to knit that blanket for a coworker of mine who is pregnant. Any tips since you have started it already?